In our selfie obsessed culture, everyone wants flawless skin. But the reality is often hidden beneath makeup apps and filters. But when you have healthy skin, the only filter you need is #nofilter. We used this insight to pitch to PCA Skin for the launch of their Intensive Pigment Eraser and were the only creative team on this pitch. 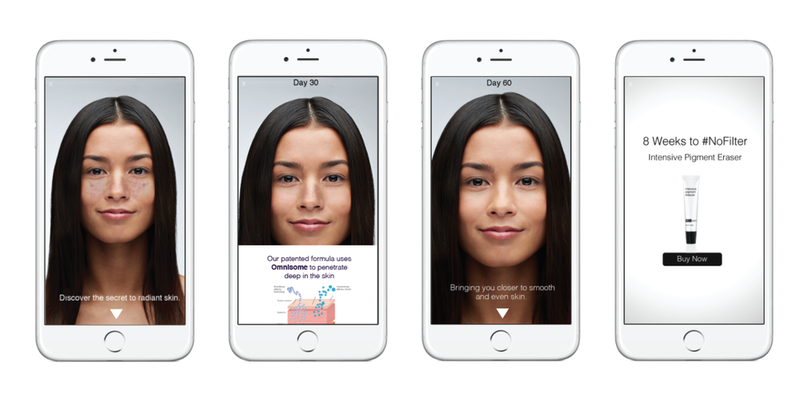 FACEBOOK CANVAS \\ Serve as educational tool allowing users to scroll through information to reveal clear skin. FACEBOOK CHAT BOT \\ Enable customers to ask questions and offer recommendations for their skin care routine. INSTAGRAM \\ Populate #PCASkinSwatch with transformation videos of varying skin tones. MICROSITE \\ Customers upload their selfies to try various "filters" including the Intensive Pigment Eraser (IPE). TRADE SHOW DISPLAY \\ Interactive wall allows people to tap on faces to help clear dark spots.